Ron Weinstock's semi-regular collection of observations, reviews and more about blues, jazz and other matters informed by the blues tradition. 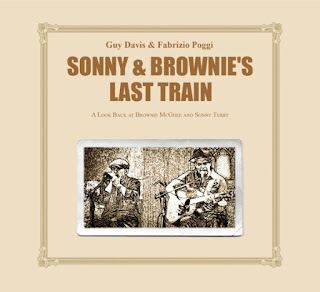 Guy Davis' latest release, with his partner harmonica player Fabrizio Poggi is a tribute to the legendary duo of Sonny Terry and Brownie McGhee. While Terry & McGhee were among the leading exponents of the Piedmont blues style, Davis' approach is most assuredly his own. For example on "Shortnin' Bread," his guitar style employing a repeated riff is more akin to the Mississippi Delta and Memphis artists than heard in Carolina tobacco towns. Similarly, Davis' guitar accompaniment of "Baby Please Don't Go Back To New Orleans," evokes Mississippi Fred McDowell and Leadbelly. This is not a criticism but an observation. There are times they do play in the easy flowing Piedmont style as in the cover of Elizabeth Cotten's "Freight Train," although Davis modeled his playing here on Cotten's original (as he observes in his liner notes). This is not a criticism as Davis and Poggi deliver this performance in their own manner, and not as simple revivalists. The album opens with Davis' title track, an affectionate tribute to the pair. The remainder are songs to some extent associated with Terry & McGhee, even if from other sources and several are probably more associated with Leadbelly such as "Shortnin' Bread," "Take This Hammer" and "The Midnight Special." "Take This Hammer," is an interesting performance with the accompaniment suggesting the gospel tune, "Glory, Glory, Hallelujah." Among the performances rendered in the Piedmont style are the afore-mentioned "Freight Train," the superb "Hooray, Hooray These Women Is Killing Me," and "Step It Up and Go," associated with Josh White and Blind Boy Fuller, which Davis has recorded before. There is a strong rendition of "Walk On," one of the songs most associated with Terry & McGhee. If the rendition of St. Louis Jimmy's "Going Down Slow," is similar to the somewhat generic treatment Terry & McGhee gave it, Davis and Poggi are more in a Delta Blues style for Johnny Temple's "Louise, Louise" as opposed to the Broonzy cover that influenced Terry and McGhee. Regardless of the manner specific songs are performed, there is plenty to enjoy on "Sonny & Brownie's Last Train." If Davis' somewhat gruff singing lacks some of the easy flowing quality of particularly Brownie McGhee, the interplay between him and Poggi is in its own manner as marvelous and Terry and McGhee. In his liner notes, Davis provides a written appreciation of Terry and McGhee and in an insert provides notes on the songs (although the notes on "Louise, Louise" fail to mention Johnny Temple's original) along with lyrics. This is an intriguing and welcome release, and one I suspect Terry and McGhee would appreciate if they still were with us. I received my review copy from the record company. Here Guy and Fabrizio perform the title track.